A day after naming the June 2018 Twins Daily Minor League Relief Pitcher of the Month yesterday, today we dive into some of the top starting pitcher performances during the month. There were a lot of good options. In fact, instead of the usual Top 5, we’re doing a Top 6, and we also will include six more starters under the Honorable Mention category. Before we share our choices for the Twins Minor League Top Five Starters for June, here are some terrific bullpen performances that just missed the cut. Griffin Jax - Ft. Myers Miracle - 5 G, 4 GS, 30.1 IP, 1-0, 3.26 ERA, 1.22 WHIP, 34 H, 3 BB, 16 K.
Barnes was the Twins fourth-round pick last year out of Clemson. The southpaw quickly moved from Elizabethton to Cedar Rapids. The Twins had him start the 2018 season in Ft. Myers. After posting ERAs over four in the first two months of the season, Barnes seemed to put things together in June. Opponents hit just .231/.328/.260 (587) against him. Barnes is just 22-years-old. Balazovic was the Twins’ sixth-round pick in 2016 out of secondary school in Ontario. He impressed that season in the GCL, but he struggled at the same level in 2017. He had an impressive spring training and continued to pitch well at Extended Spring Training. He was promoted to Cedar Rapids after Memorial Day. He made one relief appearance and was sent back to Ft. Myers. Ten days later, he was back up and entered the Kernels rotation. He was very good in his four starts. 36 strikeouts and four walks is very impressive. That equates to 14.1 K/9. Opponents hit .250/.290/.386 (.677) against him during June. He will not turn 20 until mid-September. It was another solid month for the 23-year-old left-hander. He was the Twins eighth-round pick in 2017 out of Western Carolina. Last year, he pitched for Elizabethton and ended the season with Cedar Rapids. While he had a strong 2.67 ERA in June, he’s got a 2.69 ERA on the season. He’s been good, and he’s been consistent. For the month, opponents hit .237/.272/.309 (.581) against him. While he doesn’t throw real hard, he has plenty of velocity (low 90s) to go with strong secondary pitches. As important, he’s got very good control. Ober was the Twins 12th round draft pick in 2017 out of the College of Charleston where he was that national freshman of the year, but then he needed Tommy John surgery. He missed more time with other injuries. When healthy, the 6-8 right-hander has a lot of potential. He hyperextended his knee in spring training and stuck in Extended Spring for about six weeks. In his first start, he gave up six earned runs in just 2/3 of an inning. That certainly affected his season’s ERA, but he was good in June. He limited base runners. A 9 to 1 strikeout to walk rate certainly helps. Opponents hit just .221/.247/.337 (.584) in June. While his return to the big leagues on the final day of June didn’t go great (though it was as good as any other Twins pitcher against the Cubs), Mejia earned his return to the big league club. It may have happened sooner for the 25-year-old if not for a blister earlier in the season. Opponents hit just .170/.223/.250 (.473) during the month. He went at least six innings in all five of his Red Wings starts. He gave up two run once. On his 25th birthday, he threw seven shutout innings. Mejia has earned an extended stay in the big leagues. The Twins drafted the 6-8 right-hander in the 15th round of the 2016 draft out of Cal State-San Bernadino. He pitched well at the end of that season in Elizabethton. He spent the 2017 season in Cedar Rapids where he posted a 5-3 record with a 3.11 ERA. In 75 1/3 innings, he walked 22 and struck out 92. He’s been even better in 2018 in Ft. Myers and earned his spot on the Florida State League All Star team. He’s currently 7-3 with a 2.54 ERA over his first first 12 starts with the Miracle. He has given up more than two runs in just two of his 12 starts (and once he gave up three). He was obviously very good in June. Opponents hit just .168/.210/.242 (.452) against him during the month. Not included in those stats (or the stats above) are the two scoreless innings that he threw in the All Star game as well. Wells has the high and the pitches. He’s got a good fastball that reaches into the mid-90s at time. He’s got a couple of good breaking balls. He has a slow curveball that drops as well as a slider that darts out of the strike zone. He’s also got an improving changeup. He’s also shown a great work ethic. In the offseason, he worked out a lot and lost over 30 pounds. It’s possible that Wells will get an opportunity to end the season in Chattanooga with the Lookouts. For now, he’s pitching really well with the Miracle and for it, he is our choice for Pitcher of the Month. 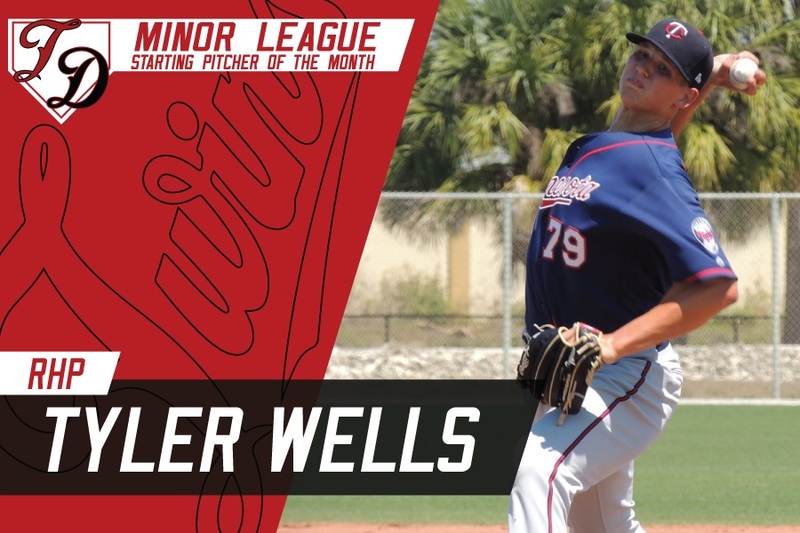 Congratulations to our Twins Daily Minor League Starting Pitcher of the Month of June, Ft. Myers Miracle right-hander Tyler Wells. Feel free to discuss and ask questions. Tyler Wells looks to be a very deserving winner, congrats! Thanks for the write up. Also encouraging is the fact that for the most part these are not high draft picks. Some very impressive numbers from the last couple of years draft picks. Of the top six, Seth, who has the highest ceiling?Are any of these potentially #1 or #2 starters? I would think Balazovic may be.But that is based on a couple early starts where he was as good as anyone could hope for.Should he continue pitching like he has for the rest of the year, I would think he would be jumping up the rankings. I was thinking Wells should go to Chattanooga and they should put Stewart in the pen.Stewart has a pretty high WHIP and not a ton of K's.I think his suff will play up in the pen. A bummer not to see Gonsalves or Littell on the list.Would be nice to know they have conquered AAA and are ready for another challenge but they appear to be challenged right where they are for now. How long does Wells have to keep being at the top of every league he’s in before he gets to be a top 30 MLB team prospect? Stewart is in Rochester now. Stewart is finally getting the Ks... walk/hits seem a bit high. Not sure if that's adjustments he's making or what. He's always had the stuff. Also worth noting he's a GB heavy pitcher. I wonder what how many of those hits are ones that woudlnt' get through in the majors. I like each of these guys as possible big leaguers. Mejia was a good prospect too who could become a 4 probably. I mean, any of these guys could be MLB starters. Any #1s? I mean, the odds of that are always very low. Graterol is probably the only Twins pitching prospect with true #1 upside. Lots of 3-ceilings... but again, hard to know which will be which. The old Corey Kluber wasn't ever a high prospect for Cleveland thing rings very true. the 2017 draft looks pretty nice at this point. hopefully a sign that scouting, drafting, and development are figuring out out with the new FO. Seth, are these player of the week/month the official awards from the big club or from Twins Daily only? Heading down to Fort Myers. The time I’m able to spend at the ballpark is always limited and varies, but hoping to see at least one of the two games being played at home this week ... #6 Barnes pitches Wednesday, #1 Wells pitches Thursday ... decisions, decisions ... if I can’t get to both. Fascinating.The players we know best are in the additional names and not the top six except for Mejia who has already peaked as far as I am concerned.He is a filler and therefore he will always look good in the minor leagues.